The photograph from around 1935 shows the town centre as well as the latest developments, which extend northward towards the railway line. 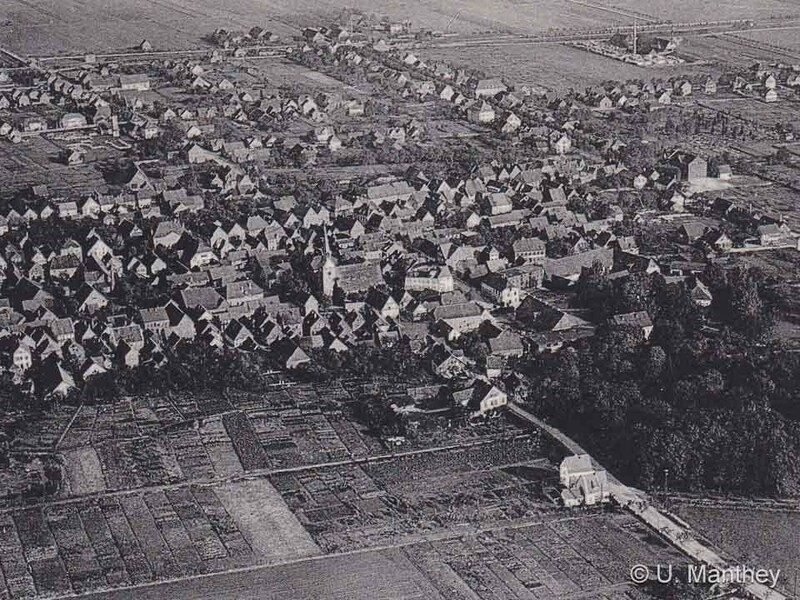 Die inhabitants of the settlement known as "Helereispring" (later: Hallerspringe) around the year 1000 were called citizens for the first time in 1255. The earliest designation as a town took place around 70 years later. The town charter was granted by the Earls of Hallermunt, who in 1282 transferred their place of residence from their castle, situated in the "Kleiner Deister", to Springe. Repeatedly plagued by wars and fires the population of the town mainly lived from agriculture and lumber industry and from transit traffic. New workplaces were created after 1840 by the emerging textile industry, which was later replaced by wood processing and lime production. Today, the important industrial branches are electrical engineering as well as the metal and pharmaceutical industry. Owing to the access to the railway in 1872 tourism flourished. The "Wisentgehege" (an enclosure for wisents), an area which was formerly used for the pig hunt, has become a major tourist attraction over the past few decades. Besides, a large number of educational institutes can be found in Springe. The former district town, which is now part of the Hanover region, consists of its core town in the Deister, the town of Eldagsen as well as ten other incorporated parishes.